Peanuts are generally eaten as snacks after roasting and are frequently constituents in snack bars, chocolates and breakfast cereals. Peanuts are often found in Oriental (Chinese or Indian) foods. Foods can also contain peanut oils with various levels of refining. The prevalence of allergy to peanut has been estimated as between 0.3% to 1.5% in studies from Britain, Canada, France and the USA. These studies are hard to compare as different age groups were studied with the highest 1.5% estimate from 3-4 year olds from the Isle of Wight (UK). Much lower prevalences seem to occur in some other countries despite high peanut consumptions. The symptoms of allergic individuals after eating peanut range from relatively mild symptoms, such as the oral allergy syndrome, to severe symptoms requiring emergency treatment such as anaphylaxis or asthma (severe symptoms seem more common with peanut than with most food allergies). Skin reactions such as urticaria (hives) or angioedema (wheals) are the most common symptoms. Peanut is the commonest cause of fatal food-related allergic reactions. Thus peanut and products thereof are listed in annex IIIa of the EU directive on labelling of foods. It is also listed as a major food allergen by the FDA (USA) labelling regulations. Allergy to peanut is associated with allergy to certain legumes such as lupin, with approximately 50% of peanut allergic individuals reacting to lupin. Whilst many peanut allergy sufferers have IgE to soya, they rarely suffer a reaction on eating soya. Peanut allergic individuals frequently react to tree nuts despite the absence of a close botanical relationship. Recently, some birch pollen allergic patients have been shown to react to peanut. Peanut is a legume, native to South America. The peanut, Arachis hypogea, belongs to the Papilionacea family of the Fabales order, along with lentils, chickpeas, peas, beans and soy. Other common names for peanut are groundnut and earthnut due to the characteristic feature of the pods maturing underground. Peanut is a common snack food in westernised society, although it is a common weaning food in other societies. The world export market for peanut is 1.3 million metric tons per year (shelled basis), with the US, China and Argentina being the dominant exporters. Sixty percent of U.S. raw peanut exports are to the EU. There are three broad types of peanuts which account for more than 99% of US production: Flo-Runner, Virginia and Spanish. There are no obvious differences between them with respect to their potency to cause allergy. Peanut allergy is a so-called IgE-mediated food allergy. IgE (Immunoglobulin E) is the allergy antibody. Allergy to peanut is caused by proteins in the kernel. As all seeds, peanuts are rich in protein; in particular the so-called storage proteins that serve as “source material” during the growth of a new plant. Some of these storage proteins have been shown to be the most important allergens: a vicilin and an albumin. In professional literature, these allergens are usually called Ara h 1 and Ara h 2 from the Latin name of peanut, Arachis hypogea. Both allergens are very stable during processing steps that involve heating, but significant differences have been reported depending on the method. Roasted peanuts appear to be more allergenic than boiled and fried peanuts. Peanut is the commonest cause of fatal food-related allergic reactions. Allergic reactions to peanut show the typical range from mild local swelling and itching in the mouth and throat to severe life-threatening reactions including shortness of breath and drop of blood pressure (anaphylactic shock). In contrast to some other food allergies however, severe reactions seem to play a dominating role, even on first exposure. Symptoms like tingling of the lips are a clear warning for contact with peanut that might develop rapidly into a severe reaction. Proximity to peanut and even skin contact appear safe for most peanut allergic individuals, although there have been reports of reactions induced by inhalation and after minimal cutaneous contact and even kissing. As peanuts are legumes, there has been real concern that reactivity to other legumes would be common in peanut allergic subjects. This concern is based on the expectation that similar proteins in related foods will also cause reactions. Such reactions are referred to as cross-reactions. Indeed, storage proteins in e.g. soy and pea are very similar as their counterparts in peanut. In contrast to some other well known food allergies, cross-reactive allergy appears to be rare for legumes. Most peanut allergic individuals are tolerant of soy. This does not mean that absolutely no patients exist that demonstrate cross-reactive allergy to multiple legumes, but it is rare. Allergy to nuts from unrelated botanical families of trees, such as almond, walnut, hazelnut and Brazil nuts is more frequent among peanut allergic patients. Approximately thirty to fifty percent of individuals with peanut allergy will make IgE antibodies to one or more of these tree nuts. They are at risk of developing allergy to these nuts and should therefore be screened for that. Up to 80% of peanut allergic children react to the first known exposure to peanut. Until now, it is unknown how these children developed allergy without direct contact with the food. One of the possibilities is that consumption by the pregnant and weaning mother brings the child in contact with peanut protein. Some investigations support this explanation but others do not find the same evidence. Whether avoidance by the mother is effective remains to be established by further studies. There is also some concern that exposure through the skin by the use eczema creams containing peanut oil in the early 1990’s might have contributed to the occurrence of peanut allergy. The UK Government have recently advised that soy allergic individuals should avoid peanut oil containing medications and visa versa, but the evidence for this recommendation is not secure at present. In Westernized societies, the prevalence of peanut allergy among children is estimated to be around 0.5 to 1%. In contrast to what is observed for milk and egg allergy, most children do not outgrow their peanut allergy. It is estimated that around 75% of the cases are persistent. It is important to evaluate young children by challenges at regular intervals for outgrowth of their peanut allergy, because avoidance is a heavy burden. The occurrence of peanut allergy appears to be increasing, especially in children. It is equally common across Northern Europe as in the USA, according to the increasing Americanisation of the European diet. Allergy to other legumes such as lentils and chick peas is more common in the Mediterranean region. Peanut was the first food to be formally examined to establish threshold doses. The lowest reported threshold doses for peanut appear to be below or near 1 milligram. The differences in the levels of threshold dose in these studies may relate to the preparation method of the peanut source used and standardised, multi-centred studies are underway. Nevertheless, one thing is clear; a really tiny piece of a peanut can be a threat to a peanut allergic patient. An average scaled peanut weighs between 500 and 1000 mg. This means that 1/1000 of a peanut is enough to trigger a reaction in some patients. Diagnosis of peanut allergy starts with recording a clear clinical history to establish a link between allergic reactions and peanut. Skin prick tests and measurement of specific IgE levels are used to support a history-based suspicion of peanut allergy. The improved quality of these tests has considerably decreased the need for challenges with peanut to confirm allergy. In a hospital-based clinic population, positive skin prick tests appear to be very sensitive with sensitivity and positive predictive values above 90%. Nevertheless, the gold standard of diagnosis still is the double-blind placebo controlled food challenge with peanut. In this challenge increasing doses of peanut are administered to the patient as well as placebo meals not containing peanut. Both patient and doctor are unaware of the meals with and without peanut. Effective blinding of the taste of peanut is essential for such challenge procedures. Atopic subjects who are skin prick positive to peanut have been shown to have approximately a fifty percent chance of having clinical reactivity confirmed during a double blind food challenge. Young children with a positive skin prick test but with no history of reactivity to peanut need to be fully assessed, including a food challenge if necessary, before they enter the school environment. Where do I find peanut? Peanut has been used in many different forms as an individual food but also as a cheap filler or substitute for more expensive or exotic foods. Peanut flour is a very versatile product with relatively low carbohydrate and high protein content. It can constitute up to 4-8% of high protein bars and up to 15% of baked goods like (low-carbohydrate) cookies. It is widely applied in seasoning blends, sauces, and dressings. Although this latter practice has probably decreased recently with the increased awareness of peanut allergy, such less obvious use of peanut is still a significant risk for peanut allergic patients. Other products that might contain peanut are breakfast cereals, candies, chilli, egg rolls, ice cream, margarine, marzipan, milk formula, pesto sauce and soups. Peanut is often found in non-European dishes such as Chinese or Thai food prepared in restaurants for on-site consumption or home consumption. Peanut oil is a commonly used form of vegetable oil, but in the vast majority of cases this is highly refined peanut oil. Refined peanut oil appears to have a good safety profile in most countries, whereas crude peanut oil is likely to be allergenic for a substantial proportion of individuals. Peanut-derived ingredients can be found in detergents for dishwashing and laundry, in hand soaps, shampoos, lotions, salves and crèmes, shaving cream, cosmetics, and even in metal polish, bleach, ink and axle grease. Contact with such products can cause allergic reactions in peanut allergic patients. In the absence of any definitive treatment at present the mainstays of treatment for peanut allergy are vigilance and avoidance. The use of epinephrine, i.e. carrying an epi-pen, is essential to be able to act in case of an adverse reaction. Peanut is very difficult to avoid and it can be predicted that accidental exposures will happen. In many cases reactions are less severe after follow up and institution of a management plan, but that cannot be guaranteed as other circumstances may supervene such as dose and route of exposure, asthma status, exercise prior to ingestion, use of alcohol or pollen season. Peanut allergic patients should in all cases carefully read labels on food products. According to recent EU legislation (2003/89/EC) and the list of the Codex Alimentarius Commission, the presence of peanut or peanut-derived ingredients should always be on the label. Despite this obligation, it is still advised to carefully study food labels. Other indications that peanut is a possible ingredient are ground nut, arachis oil, hydrolyzed plant protein, vegetable oil, vegetable protein, natural flavouring and oriental sauce. Other Information: Peanut and products thereof are listed in annex IIIa of the EU directive on labelling of foods. Peanut allergy seems to be presented primarily in the young and once sensitised individuals often remain allergic for life. Allergy to peanuts is thought to be the most common cause of deaths related to food allergy. As there are many studies relating to peanut, only some key articles are highlighted below. Patients were classified by severity with grade 1 (mild)––localised cutaneous erythema/ urticaria/angioedema/oral pruritis; grade 2 (mild)––generalised erythema/urticaria/angio-oedema; grade 3––at least grade 1 or 2 plus gastrointestinal symptoms/ rhinoconjunctivitis; grade 4 (moderate)––mild laryngeal oedema (voice change/tightening of throat)/mild asthma; and grade 5 (severe)––pronounced dyspnoea/ hypotensive symptoms (light-headedness/collapse/loss of consciousness). Protocol: (controls, definition of positive etc)Clark and Ewan (2003) used a positive (histamine 10 mg/mL) and negative control (saline). SPT wheal diameters were listed as <3 mm, 3-7 mm and >8 mm. Hourihane et al. (1996; 1997)    defined >3 mm as positive. Hourihane et al. (1997)  tested 111 patients either reporting peanut allergy in a questionaire or referred as suspected peanut allergic individuals . Hill et al. (2001)  tested 643 patients. Horihane et al. (1997)  used SPT to verify self-reported peanut allergy and found that 16/111 patients gave negative SPT. There was a correlation between mean wheal diameter and the severity of reported symptoms. Hill et al. (2001)  found 270 positive SPT. They found that skin prick test weal diameters > 6 mm were strongly predictive of allergy and more predictive than IgE measurements. Several studies including the article by Clark and Ewan (2003)  suggest that it is hard to predict the severity of peanut allergy from SPT results. However, patients with SPT ≥8 mm and CAP≥ 15 kU/L were rarely tolerant when tested by oral challenge. Most studies have used commercial extracts of peanut. However, some studies have used biochemically defined allergens including epitopes of Ara h1, Ara h 2 and Ara h 3 (Beyer et al. 2003)  and recombinant Ara h 5 (Kleber-Janke et al., 2001) . Mittag et al. (2004)  used recombinant Ara h 8 and also extracted ground peanut flour in a buffer containing polyvinylpolypyrrolidone and diethyldithiocarbamate for RAST (inhibition). For EAST inhibition, ground peanuts were extracted in 0.1M ammonium carbonate at pH 8.4 for 4 hours at 4°C. After centrifugation, the supernatant was filtered (0.2 µm pore size), dialyzed, and stored at –20°C after lyophilization. For immunoblotting, Mittag et al. (2004)  extracted raw ground peanuts in distilled water (1:10 w/v, 2 hours) and centrifuged for 25 minutes at 13,000xg. The fatty layer at the top and the residue were discarded. The clear solution was defatted (3 times) and centrifuged. Hourihane et al. (1997)  tested sera from 346 patients for peanut specific IgE. Sampson and Ho (1997)  tested sera from 196 patients with atopic dermatitis of whom 35 were judged to be peanut allergic and Sampson (2001)  tested sera from 100 children of whom 68 were judged to be peanut allergic. Hill et al. (2001)  tested sera from 137 patients for peanut specific IgE. Clark and Ewan (2003)  tested 1000 nut allergic patients. Bernard et al. (2003)  tested sera from 96 children of whom 76 showed a positive open challenge or clear history of allergy. Beyer et al. (2003)  tested 31 sera, 15 peanut allergic and 16 tolerant. Kleber-Janke et al. (2001)  tested sera from 3 patients with mild symptoms and one with severe symptoms. Mittag et al. (2004)  tested sera from 20 patients, 9 from Switzerland and 11 from the Netherlands, who were DBPCFC positive to peanut and also allergic to birch pollen. Clark and Ewan (2003)  found that there was no correlation between the CAP level and symptom severity and that there was only a limited correlation between the CAP level and the SPT results. Similarly Hourihane et al. (1997)  found no link between IgE levels and clinical severity. Sampson and Ho (1997) , Sampson (2001)  and Hill et al. (2001)  showed that the probability of a patient being peanut allergic increased with peanut specific IgE so that it is possible to confidently diagnose some patients as peanut allergic without a food challenge. Thus Sampson (2001) gives 15 kU/L for 95% confidence. However, lower IgE levels do not imply absense of allergy. Hill et al. (2001) suggest that SPT data can be combined with CAP to increase confidence. Bernard et al. (2003)  found that 85/96 sera from allergic children showed a positive IgE response to whole peanut protein extract (including all with severe symptoms), 66/96 and 48/96 sera showed an IgE response to Ara h 2 and Ara h 1, respectively (i.e. 77 and 56%). The lowest detectable concentration of specific IgE would lead to a clinical sensitivity of 100% in the most severe subgroup. The sensitivity is much decreased when purified allergens are used. Taking 5 or 15 kU/l anti whole peanut protein IgE as predictive of allergy would avoid the need of a food challenge in 24 patients (92%) or 21 patients (81%) respectively in the severe group of the study population. Beyer et al. (2003)  defined 4 groups of patients with peanut specific IgE: Group A - 10 patients with high specific IgE (100 kU/L); Group B - 5 challenge positive with mean 4.08 kU/L; Group C - 10 challenge negative with mean 3.93 kU/L; Group D - 6 asymtomatic with mean 4.1 kU/L. Groups A and B were peanut allergic, Group C had outgrown their allergy and group D had never shown symtoms. Mittag et al. (2004)  found that all 20 patients were CAP positive to Bet v 1, 7/20 were CAP positive to Bet v 2 and 18/20 were CAP positive to peanut (0.46-42 kU/l). 17/20 sera gave positive RAST to recombinant Ara h 8 (0.56-86.4 IU/ml). RAST results for Ara h 1, Ara h 2 and Ara h 3 were lower and were below the detection limit in 3/17 sera. Mittag et al. (2004)  suggest that tests with commercial extracts do not efficiently detect this group of patients. Kleber-Janke et al. (1999)  and Kleber-Janke et al. (2001)  used 12% or 15% acryamide 1D SDS-PAGE gels. Samples were boiled in buffer with SDS and beta-mercaptoethanol before loading. Mittag et al. (2004)  separated raw peanut extract by SDS-PAGE on a Novex XCell II system with a 4% to 12% gradient gel. Kleber-Janke et al. (1999)  and Kleber-Janke et al. (2001)  transferred proteins to nitrocellulose membranes using a semidry device. Membranes were washed, blocked and incubated with sera (1:50 dilution), then alkaline phosphatase conjugated monoclonal anti human IgE was added. Allergens were revealed with 5-bromo-4-chloro-3-indolyl phosphate/nitroblue tetrazolium. Mittag et al. (2004)  transfered proteins onto nitrocellulose. The 3 mm strips (4 µg of protein per strip) were incubated overnight with 150 µL of patients' sera. After washing with phosphate buffered saline containing 0.1% v/v Tween 20, bound IgE was detected with iodine 125–radiolabeled sheep anti-human IgE (SH25-1-p7; Sanquin). Autoradiography was performed with Kodak-Biomax-MS films (Kodak, Rochester, NY). Using recombinant allergens, Kleber-Janke et al. (1999)  found that Ara h 1 was recognised by 65%, Ara h 2 by 85%, Ara h 4 by 53%, Ara h 5 by 13%, Ara h 6 by 38% and Ara h 7 by 43% of sera from 40 peanut allergic patients. 14 different patterns of affinity were noted. Kleber-Janke et al. (2001)  reported that the sera from three patients with mild symptoms only recognised Ara h 5 at 14 kDa while sera from a patient with severe symptoms recognised many allergens. Beyer et al. (2003)  report that peanut allergic and peanut tolerant individuals with peanut reactive IgE recognise a different pattern of epitopes. Most notably the 3 immunodominant epitopes of Ara h 2 (Stanley et al., 1997)  were recognized by 60% to 73% of the patients with peanut allergy but only by 6% of the individuals tolerant to peanut. Shreffler et al. (2004)  found that individual sera from 77 patients bound in diverse ways to an array of 213 peptides from the sequences of Ara h 1, Ara h 2 and Ara h 3. Binding to recombinant Ara h 1, Ara h 2 and Ara h3 was also measured as 77%, 75% and 77% positive respectively, with 97% recognising one of the three allergens. They conclude that patients whose sera recognise many epitopes are more likely to react to small quantities of peanut and to suffer severe symptoms. Defatted roasted peanut meal combined with commercial wholegrain wheat flour (Hourihane et al., 1997) . Peanut oil with 0.1% peppermint oil or 1% cocoa malt flavouring followed by open challenge to peanut (Hourihane et al., 1997) . Partially defatted roasted peanut in mashed potato (Wensing et al., 2002) . Roasted crushed peanuts in apple or potato (Morisset et al., 2003) . For the 9 Swiss patients, Mittag et al. (2004)  used 1.0 g of partially defatted and lightly roasted peanut flour (12% fat, peanut protein content of 50%; Golden Peanut Company, Alpharetta, Ga) mixed with oat flakes together with 32% brown sugar and 0.33% salt to a final weight of 100 g and mixed with 100 mL of warm water. Two drops of bitter almond aroma and one drop of banana aroma were added to mask the peanut flavor. An initial local mucosal challenge or spit phase was followed by ingestion (Ballmer-Weber et al. 2000) . DBPCFC has been used in many studies. The studies highlighted below have either given dose response information with peanut or used peanut oil. Hourihane et al. (1997)  challenged 60 patients. Hourihane et al. (1997)  challenged 14 patients. Olszewski et al. (1998)  challenged 11 patients. Morisset et al. (2003)  challenged 103 patients with peanut and also 29 with peanut oil. Mittag et al. (2004)  reported challenges to 20 patients. 11 of these may be reported in Wensing et al. (2002) . Hourihane et al. (1997)  found that out of 14 patients, 2 had subjective reactions to 100 microgram, one subject had a systemic reaction to 5 mg of peanut protein, and two subjects had mild objective reactions to 2 mg and 50 mg of peanut protein. Five subjects did not react to any dose up to 50 mg.
Wensing et al. (2002)  found that the threshold doses for allergic reactions ranged from a dose as low as 100 µg up to 1 g of peanut protein. 50% percent of the study population already had an allergic reaction after ingestion of 3 mg of peanut protein. Morrisset et al. (2003)  found that 18% reacted to <65 mg. and 3.9% reacted to 15 mg. The lowest reactive dose was 5 mg of peanut. With peanut oil, 5/29 reacted to 5 ml and in all 10/29 reacted to 30 ml. Mittag et al. (2004)  used 4 doses containing 10, 20, 40, and 80 mg for the local mucosal challenge or spit phase. 4 doses containing 50, 100, 200, and 400 mg of peanut protein were subsequently used for ingestion. 3/9 patients reacted by subjective symptoms to 10 mg. of peanut, 2/9 to 20 mg. and 3/9 to 40mg. all in the spit phase. 1/9 showed subjective symptoms after ingesting 100 mg. of peanut. Objective symptoms were observed at 10 mg. and 80 mg. in the spit phase and at 100 mg. and 400 mg. on ingestion in 4 patients. Taylor et al. (2002)  have reviewed several studies aimed at defining thresholds for reaction to peanut. One caveat with these studies are that the patients with the most severe symptoms, who may respond to the lowest doses, are frequently not included. In addition, in several studies some patients responded to the lowest dose tried and hence the no observed effect level (NOEL) could not be determined. Hourihane et al (1997)  reported oral itching; throat itching; facial flush; lip tingling; lip swelling; urticaria; vomiting; wheezing using 14 patients. Hourihane et al (1997)  reported that 6/60 (4 only subjectively) reacted to crude peanut oil and none to refined peanut oil. 56/58 (excluding oil reacters) gave a positive open challenge. Olszewski et al. (1998)  reported that 4/11 patients reacted to peanut oil. Wensing et al. (2002)  report the subjective symptoms as oral allergy syndrome for all 26 patients with 14 also suffering gasterointestinal symptoms. Objective symptoms occured in 6 patients, 3 with lip swelling, 1 with laryngeal edema, 1 with vomiting and 1 with both laryngeal edema and vomiting. Morrisset et al. (2003)  from 103 positive challenges reported that 3/103 showed drop in blood pressure and 21/103 respiratory symptoms. None of the 10/29 positive challenges to peanut oil showed severe symptoms. Mittag et al. (2004)  report the symptoms as oral allergy syndrome for all 9 Swiss patients. The 4 objective reactions also included flush (1/9), blistering of oral mucosa (2/9) and tighness of throat, nausea and blistering of oral mucosa (1/9). Clinically relevant cross-reactivity between pea and peanut has been observed in three patients (Wensing et al., 2003) , as well as between peanut and lupin (Leduc et al. 2002) . Cross-reactivity of IgEs occurs between peanut and soybean (Lack et al. 2003) . However, individuals with peanut allergy rarely show clinical cross-reactivity to soy (Sicherer et al. 2000 ). Inhibition ELISA shows that extracts from some tree nuts (almond, Brazil nut and hazelnut) bind anti-peanut IgE from the sera of 4 peanut and tree nut allergic patients (de Leon et al. 2003 ) and suggests that clinically relevant cross-reactivity between tree nuts and peanut occurs despite the lack of a close botanical relationship. Mittag et al. (2004)  have shown that there is clinically relevant cross-reactivity between birch pollen and peanut. Prevalence data has been presented by Lack et al. (2003)  who found 49 children with a history suggesting peanut allergy of whom 23/36 were positive on challenge in a total of 13,971 children aged 4-6 years born in 1990. The unchallenged included 2 not located, 2 had had anaphylaxis and 9 parents refused. This suggests 0.22-0.24% were allergic to peanut at that age. A putative link between the development of peanut allergy and the use of creams containing peanut oil was made. Grundy et al. (2002)  reported two cohorts of 4 year olds: 1218 of 1456 born 1989 and 1273 of 2876 born 1994-1996. Questionaires gave 6/1218 and 13/1273 peanut allergics (0.5% and 1.0%) and SPT gave 11/981 and 41/1246 (1.1% and 3.3%). This suggests rising rates of peanut sensitisation but no statistically significant differences in clinical reaction were observed. Several articles have explored how the symptoms of peanut allergy change with time and whether children resolve peanut allergy (most milk or egg allergic children do lose their allergies). This is sometimes called "the natural history of peanut allergy". These studies showed that 8% - 21% of children became able to tolerate peanut over approximately 5 years from diagnosis (Hourihane et al. 1998 ; Vander Leek et al. 2000 ; Spergel et al. 2000 ; Skolnick et al. 2001 ). Resolution of peanut allergy was associated with younger children rather than teenagers or adults; with milder initial symptoms (urticaria rather than anaphylaxis); allergy to peanuts alone rather than to several foods; and with lower IgE levels at diagnosis. Vander Leek et al. (2000)  noted the frequent occurrence of more serious symptoms on subsequent peanut exposures which caused Sampson (2000)  to suggest that all individuals diagnosed as peanut allergic should carry an Epipen. Subsequently, further studies showed that some of the individuals who had passed a challenge test showing tolerance of peanut subsequently suffered recurrence of peanut allergy (Fleischer et al. (2003) ; Fleischer et al. (2004) ). This seemed to correlate with continuing to avoid peanuts after the challenge, suggesting that consumption maintained tolerance. Bernard H, Paty E, Mondoulet L, Burks AW, Bannon GA, Wal JM, Scheinmann P.
Serological characteristics of peanut allergy in children. Olszewski A, Pons L, Moutete F, Aimone-Gastin I, Kanny G, Moneret-Vautrin DA, Gueant JL. Grundy J, Matthews S, Bateman B, Dean T, Arshad SH. Rising prevalence of allergy to peanut in children: Data from 2 sequential cohorts. Beyer K, Ellman-Grunther L, Jarvinen KM, Wood RA, Hourihane J, Sampson HA. Measurement of peptide-specific IgE as an additional tool in identifying patients with clinical reactivity to peanuts. Frémont, S. Errahali, Y. Bignol, M. Montagnon, I.Metche, M. & Nicolas J.P.
What about the Allergenicity of Vegetable Oils? Kleber-Janke T, Crameri R, Scheurer S, Vieths S, Becker WM. Patient-tailored cloning of allergens by phage display: peanut (Arachis hypogaea) profilin, a food allergen derived from a rare mRNA. Leduc V, Moneret-Vautrin DA, Guerin L.
Wensing M, Knulst AC, Piersma S, O'Kane F, Knol EF, Koppelman SJ. Patients with anaphylaxis to pea can have peanut allergy caused by cross-reactive IgE to vicilin (Ara h 1). Lack G, Fox D, Northstone K, Golding J; Avon Longitudinal Study of Parents and Children Study Team. Factors associated with the development of peanut allergy in childhood. Wensing M, Penninks AH, Hefle SL, Koppelman SJ, Bruijnzeel-Koomen CA, Knulst AC. Hourihane JO'B, Kilburn SA, Nordlee JA, Hefle SL, Taylor SL, Warner JO. Shreffler WG, Beyer K, Chu TH, Burks AW, Sampson HA. Microarray immunoassay: association of clinical history, in vitro IgE function, and heterogeneity of allergenic peanut epitopes. Selective cloning of peanut allergens, including profilin and 2S albumins, by phage display technology. Mittag D, Akkerdaas J, Ballmer-Weber BK, Vogel L, Wensing M, Becker WM, Koppelman SJ, Knulst AC, Helbling A, Hefle SL, Van Ree R, Vieths S.
Ara h 8, a Bet v 1-homologous allergen from peanut, is a major allergen in patients with combined birch pollen and peanut allergy. Fleischer DM, Conover-Walker MK, Christie L, Burks AW, Wood RA. The natural progression of peanut allergy: Resolution and the possibility of recurrence. Skolnick HS, Conover-Walker MK, Koerner CB, Sampson HA, Burks W, Wood RA. The natural history of peanut allergy. Vander Leek TK, Liu AH, Stefanski K, Blacker B, Bock SA. The natural history of peanut allergy in young children and its association with serum peanut-specific IgE. Hourihane JO, Roberts SA, Warner JO. Resolution of peanut allergy: case-control study. Spergel JM, Beausoleil JL, Pawlowski NA. Resolution of childhood peanut allergy. Process, chemical, enzymatic:Thermal unfolding is reversible and can be described by a three-state model with two transitions occurring at around 58 and 63 degrees C (Reddy et al. 1999 ). Allergen properties & biological function:Peanut agglutinin is a D-galactose specific lectin and binds one manganese (or other transition metal) ion and one calcium ion. Allergen purification:Crude peanut extract was prepared by extracting roasted, defatted peanut meal with 1M NaCl, 20mM sodium phosphate buffer pH 7.0 containing 8M urea, for 4h at 4C. After clarification by centrifugation at 20,000xg for 60 min at 4C, the supernatant was dialysed into 20mM bis-tris propane (pH 7.2) . Protein was loaded onto an anion exchange MonoQ column and the agglutinin eluted with a 0-1.5M NaCl gradient at 15% NaCl. The amino acid sequence of peanut agglutinin. Rodriguez-Arango E., Arango R., Adar R., Galili G., Sharon N.
Cloning, sequence analysis and expression in Escherichia coli of the cDNA encoding a precursor of peanut agglutinin. Banerjee R., Das K., Ravishankar R., Suguna K., Surolia A., Vijayan M.
Conformation, protein-carbohydrate interactions and a novel subunit association in the refined structure of peanut lectin-lactose complex. Burks et al. (1997)  found the following to be immunodominant epitopes: Ara h 1 25-34 (KSSPYQKK) Ara h 1 65-74 (EYDPRLVY) Ara h 1 89-98 (ERTRGRQP) Ara h 1 498-507 (RRYTARLKEG). Other IgE epitopes identified were: Ara h 1 48-57 (QEPDDLKQKA) Ara h 1 89-98 (ERTRGRQP) Ara h 1 97-105 (GDYDDDRR) Ara h 1 107-116 (RREEGGRW) Ara h 1 123-132 (EREEDWRQ) Ara h 1 134-143 (EDWRRPSHQQ) Ara h 1 143-152 (PRKIRPEG) Ara h 1 294-303 (PGQFEDFF) Ara h 1 311- 320 (YLQEFSRN) Ara h 1 325-334 (FNAEFNEIRR) Ara h 1 344-353 (QEERGQRR) Ara h 1 393-402 (DITNPINLRE) Ara h 1 409-418 (NNFGKLFEVK) Ara h 1 461-470 (GNLELV) Ara h 1 525-534 (ELHLLGFGIN) Ara h 1 539-548 (HRIFLAGDKD) Ara h 1 551-560 (IDQIEKQAKD) Ara h 1 559-568 (KDLAFPGSGE) Ara h 1 578-587 (KESHFVSARP) Ara h 1 597-606 (EKESPEKED). Shin et al. (1998)  extended this by analysing the effects of mutation on IgE binding to the peptides. They showed that generally alteration of a single amino acid led to the loss of IgE binding from a serum pool from 15 patients. This suggests that IgE from different patients that recognize the same epitope must interact with that epitope in a similar fashion. Shreffler et al. (2004)  used an array of 213 20 amino acid peptides with a 5 residue overlap from the sequences of Ara h 1, Ara h 2 and Ara h 3. They found that Ara h 1 contains 13 prominent IgE binding regions including a new epitope comprising residues 361 to 385, which could not be found using pooled sera. 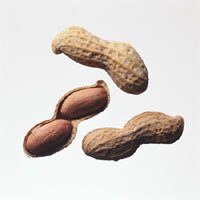 However, they found that no single epitope is recognised by more than 35% of their 77 individual peanut allergic sera. Process, chemical, enzymatic:Ara h 1 (also known as conarachin) belongs to the 7S (or vicilin) family of seed storage globulins. It is a trimeric acidic glycoprotein with a subunit molecular weight of 65,000, which associates into homotrimers in high salt. It is, like beta-conglycinin from soya, a 'large' vicilin, with a N-terminal extension of over 100 amino acids. Most of the major IgE epitopes are contained within this extension region. Wichers et al. (2004)  report that the first 78 or 84 amino acids are removed from Ara h 1 extracted from peanut depending on whether the extraction included protease inhibitors. They suggest that this occurs in planta and that the N-terminal extension is also consumed and is an allergen. The experimentally determined Mr is thus smaller than that calculated from the gene sequence, or observed for recombinant Ara h 1. It had been suggested that the anomalous Mr of conarachin on SDS-PAGE results from glycosylation (see properties below). The thermal stability has been studied by Koppelman et al. (1999)  but its allergenic properties are reported to be unaffected by thermal denaturation. The protein shows only minor secondary structural changes in 5M urea. Several IgE binding epitopes are resistant to pepsin hydrolysis (Maleki et al. 2000 ). Nature of main cross-reacting proteins:As a consequence of the homologies between the 7S globulins of legumes, around 80% of anti-Ara h 1 antibodies bind to the 7S globulin of soya, beta-conglycinin (Eigenmann et al. 1996 ). Allergen properties & biological function:Ara h 1 is one of the major storage proteins in peanut. Ara h 1 is a glycoprotein (Kolarich and Altmann, 2000)  with high mannose and complex N-glycans (van Ree et al. 2000 ). 1. Extract defatted peanut meal with 50mM Tris-HCl, pH 8.2, containing 0.2M NaCl (1:10, w:v) and purified by gel filtration on a Superose 6 HR10/30 column attached to a FPLC system. (Mills et al 1997 ) or affinity purification on Con-A Sepharose (Rigby et al. unpublished). Shin et al. (1998)  modelled the structure of Ara h 1, residues 172-586, from that of bean phaseolin and showed that the epitopes from the region modelled were spacially clustered into two regions although distant in sequence. The epitopes were towards the sites of monomer-monomer interaction in the Ara h 1 trimer and away from the interface of the two beta-barrel domains of a monomer. Maleki SJ, Kopper RA, Shin DS, Park CW, Compadre CM, Sampson H, Burks AW, Bannon GA.
van Ree R, Cabanes-Macheteau M, Akkerdaas J, Milazzo JP, Loutelier-Bourhis C, Rayon C, Villalba M, Koppelman S, Aalberse R, Rodriguez R, Faye L, Lerouge P.
N-Glycan analysis by matrix-assisted laser desorption/ionization mass spectrometry of electrophoretically separated nonmammalian proteins: application to peanut allergen Ara h 1 and olive pollen allergen Ole e 1. Koppelman SJ, Bruijnzeel-Koomen CA, Hessing M, de Jongh HH. Heat-induced conformational changes of Ara h 1, a major peanut allergen, do not affect its allergenic properties. Characterisation of Ara h 1 by two-dimensional electrophoresis immunoblot and recombinant techniques: new digestion experiments with peanuts imitating the gastrointestinal tract. Identification of a major peanut allergen Ara h 1 in patients with atopic dermatitis and positive peanut challenge. Mapping and mutational analysis of the IgE-binding epitopes on Ara h 1, a legume vicilin protein and a major allergen in peanut hypersensitivity. Recombinant peanut allergen Ara h 1 expression and IgE binding in patients with peanut hypersensitivity. Wichers HJ, De Beijer T, Savelkoul HF, Van Amerongen A. The major peanut allergen Ara h 1 and its cleaved-off N-terminal peptide; possible implications for peanut allergen detection. Shin DS, Compadre CM, Maleki SJ, Kopper RA, Sampson H, Huang SK, Burks AW, Bannon GA.
Biochemical and structural analysis of the IgE binding sites on ara h1, an abundant and highly allergenic peanut protein. Epitopes of Ara h 2 have been defined as follows: 15-HASARQQWEL-24 21-QWELQGDR-28 27-DRRCQSQLER-36 39-LRPCEQHLMQ-48 49-KIQRDEDS-56 59-RDPYSP-64 65-SQDPYSPS-72 118-LQGRQQ-122 127-KRELRN-132 143-QRCDLDVE-150 (Stanley et al 1997 ). Shreffler et al. (2004)  used an array of 213 20 amino acid peptides with 5 residue overlap from the sequences of Ara h 1, Ara h 2 and Ara h 3. They found that the Ara h 2 epitopes were similar to those previously identified. However, they found that no single epitope is recognised by more than 35% of their 77 individual peanut allergic sera. The trypsin inhibitor activity of Ara h 2 increases on roasting (Maleki et al. 2003 ). However, the protein's structure is altered, possibly with intramolecular cross-links. IgE binding by Ara h 2 also survives roasting better than boiling or frying (Beyer et al., 2001 ). Sen et al. (2002)  showed that native, but not reduced, Ara h 2 was resistant to proteases leaving a 10 kDa fragment. The homologous Ara h 6 yields a protease resistant core on digestion with trypsin and chymotrypsin which has a native-like structure (Lehmann et al. 2004 ). Two other peanut allergens, Ara h 6 and 7, have been identified which are homologous with Ara h 2. Whilst Ara h 2 is considered to be a major allergen, Ara h 6 and 7 are considered to be minor, being recognised by 38% and 43% of peanut allergic sera respectively (Kleber -Janke et al 1999 ). These may show some IgE cross-reactivity but this has not been shown. IgE cross-reactivity with other species has not been described. Allergen properties & biological function:Ara h 2 corresponds to delta conglutin, which is a member of the 2S albumin family. It is a glycoprotein with a pI of 5.2 which is thought to act as a storage protein. Maleki et al. (2003)  showed that Ara h 2 is active as a trypsin inhibitor. Recombinant Ara h 2 has been expressed in E. coli by Lehmann et al. (2003)  and purified. The recombinant Ara h 2 was identical to wild-type by immunoblotting, analytical HPLC and circular dichromism suggesting that natural and recombinant Ara h 2 have the same disulphide structure. No structure has been reported. However, NMR assignments show progress towards a 3D-structure determination of the homologous Ara h 6 (Lehmann et al. 2004 ). The sequences split into two families. The first family is formed from Q647H0, Q941R0 & Q6PSU1 which are identical except for a N-terminal extension, probably beyond the initial methionine, and a short C-terminus in Q941R0. The translation of the original sequence, L77197, is also identical. The second family, Ara h 2.02, includes Q8GV20, Q6PSU2, Q84TU1 & Q7Y1C0 which again differ mostly at their termini. The two families are 80-90% identical. Lehmann K, Hoffmann S, Neudecker P, Suhr M, Becker WM, Rosch P.
Sen M, Kopper R, Pons L, Abraham EC, Burks AW, Bannon GA. Protein structure plays a critical role in peanut allergen stability and may determine immunodominant IgE-binding epitopes. Beyer K, Morrow E, Li XM, Bardina L, Bannon GA, Burks AW, Sampson HA. Effects of cooking methods on peanut allergenicity. Maleki SJ, Viquez O, Jacks T, Dodo H, Champagne ET, Chung SY, Landry SJ. The major peanut allergen, Ara h 2, functions as a trypsin inhibitor, and roasting enhances this function. Identification and characterisation of a second major peanut allergen, Ara h II, with use of sera with atopic dermatitis and positive peanut challenge. Lehmann K, Schweimer K, Neudecker P, Rosch P.
Sequence-specific 1H, 13C and 15N resonance assignments of Ara h 6, an allergenic 2S albumin from peanut. All were in the N-terminal region of Ara h 1 and thus in the acid 40 kDa subunit. Shreffler et al. (2004)  used an array of 213 20 amino acid peptides with 5 residue overlap from the sequences of Ara h 1, Ara h 2 and Ara h 3. The Ara h 3 epitopes differed to those above in that their sera did not recognised the N-terminal epitope. They also found that no single epitope is recognised by more than 35% of their 77 individual peanut allergic sera. Process, chemical, enzymatic:It is likely that arachin is themostable, like other globulin storage proteins. Pea legumin is 72% identical and cross-reactivity might be expected. Allergen properties & biological function:The 11S storage globulin of peanuts, arachin, like other legumins and glycinins, is synthesised as approximately 60 kDa chains (like, for example proglycinin) which form trimers. On cleavage into 40 kDa N-terminal acid subunits and 20 kDa C-terminal basic subunits, which remain disulphide linked, the trimers form a hexamer of about 360 kDa. On reduction and denaturation the subunits separate and as all the epitopes appear to be in the N-terminal subunit, only this is observed on immunoblots. The 35.9 kDa acidic subunit of Ara h 4 has a pI of 5.5 (Kleber-Janke et al., 1999 ). Allergen purification:Ground peanut was extracted with 20 mM Tris buffer (pH 7.2). After 2 h stirring at room temperature, the aqueous fraction was collected by centrifugation. The peanut protein extract was applied on a 300 ml Source Q column (FPLC/AKTA protein purification system, Pharmacia, Uppsala, Sweden) previously equilibrated with 20 mM MOPS of pH 7.2 (loading buffer) at room temperature. The column was washed with loading buffer until the A280 of the effluent was less than 0.02. Proteins were eluted using a linear sodium chloride gradient in loading buffer (up to 1M in 4000ml at a flow rate of 100ml/min). Koppelman et al. (2003) . Ara h 3 and Ara h 4 sequences are 91% identical but were named independently. Normally these would be named as isoallergens. Koppelman SJ, Knol EF, Vlooswijk RA, Wensing M, Knulst AC, Hefle SL, Gruppen H, Piersma S.
Nature of main cross-reacting proteins:IgE to peanut profilin cross-reacted with cherry profilin (Pru a 4) and less strongly with celery and pear profilins. The Ara h 5 sequence shows 83% identity with soybean Gly m 3. Allergen properties & biological function:This minor allergen is an actin-binding protein of the cytoskeleton (Kleber-Janke et al., 1999 ). Kleber-Janke et al. (2001)  reported that recognition of only Ara h 5 by patient's IgE was associated with mild symptoms. The pI was reported as 4.6. An additional sequence for peanut profilin Q5XXQ5 has been deposited which is 85% identical to Ara h 5. Ara h 6 yields a protease resistant core on digestion with trypsin and chymotrypsin which has a native-like structure (Lehmann et al. 2004 ). The information given on Ara h 2 may also be relevant (Maleki et al. 2003 ; Beyer et al., 2001 ; Sen et al. (2002) ). Nature of main cross-reacting proteins:Ara h 2, Ara h 6 and Ara h 7 are homologous. Ara h 6 is approximately 60% identical to Ara h 2 and is thus treated as a different allergen rather than as an iso-allergen. However, there may be some IgE cross-reactivity. Allergen properties & biological function:Ara h 6 is a member of the 2S albumin family, which are thought to act as storage proteins. Maleki et al. (2003)  showed that the homologous Ara h 2 is active as a trypsin inhibitor. Lehmann et al. (2004)  report that recombinant Ara h 6 was purified following the method of Lehmann et al. (2003)  which reported the purification of recombinant Ara h 2. This was identical to wild-type by immunoblotting, analytical HPLC and circular dichromism suggesting that natural and recombinant Ara h 2 have the same disulphide structure. The sequences Q647G9 & Q8W251, are 97% identical and closely resemble the original Ara h 6 sequence, Q9SQG5, except that this omitted 16 N-terminal residues. There are 5 possible disulphide bridges in Ara h 6. Although the structure has not yet been published, NMR assignments show progress towards a 3D-structure determination of Ara h 6 (Lehmann et al. 2004 ). Whilst the homologous Ara h 2 is considered to be a major allergen, Ara h 6 is considered to be minor, being recognised by 38% of peanut allergic sera (Kleber -Janke et al 1999 ). Process, chemical, enzymatic:Not known. Ara h 7 may be less stable than Ara h 2 and Ara h 6 because only two disulphide bridges are conserved. Nature of main cross-reacting proteins:Ara h 2 and Ara h 6 are 40-50% identical to Ara h 7 over 80% of the sequence. It is not clear if there is significant IgE cross-reactivity. Allergen properties & biological function:Ara h 7 is a member of the 2S albumin family which act as storage proteins. Maleki et al. (2003)  showed that the homologous Ara h 2 is active as a trypsin inhibitor. The C-terminal region of Ara h 7, approximately 30 residues, shows a frameshift relative to the Ara h 2 and Ara h 6 sequences. This occurs at the same point in both the sequences, Q9SQH1 & Q647G8, although these are only 88% identical. The consequence is that two of the four disulphide bridges of the 2S albumin family cannot be formed. Ara h 7 was recognised by 43% of peanut allergic sera (Kleber -Janke et al 1999 ). Mittag et al. (2004)  reported that pepsin digestion completely destroyed the inhibition capacity of raw peanut extract within 5 seconds. The acidic extraction without pepsin lowered the inhibition capacity 2.6-fold in comparison with the extraction performed at pH 7.4. PVPP extracts from raw or roasted peanuts inhibited IgE binding to crude peanut extract. However, the inhibition capacity of the extract from roasted peanuts was 9-fold lower, suggesting low heat stability of Ara h 8. Nature of main cross-reacting proteins:IgE cross-reactivity to Bet v 1 was demonstrated by inhibition of immunoblotting in the 3 sera tested. Sequence alignment revealed an amino acid sequence identity of 45.9% with Bet v 1 and 70.6% with Gly m 4. Allergen properties & biological function:Ara h 8 may be a pathogenesis-related protein due to its sequence identities with several bona fide PR-10 proteins. Its precise function is not known but it may be a steroid binding protein as is Bet v 1 (Markovic-Housley et al., 2003 ). Allergen purification:Mittag et al. (2004)  expressed Ara h 8 in E coli. The recombinant protein was purified by chromatofocusing and size exclusion chromatography. Purification from 6 L of cultured bacteria yielded 1 mg of purified recombinant protein. The CD spectrum of rAra h 8 was similar to recombinant Gly m 4 and Bet v 1, suggesting that rAra h 8 had a similar secondary structure. Allergen purification:The 17 kDa oleosin was purified from classically extracted crude oil body proteins by two preparative SDS-PAGEs (Pons et al., 2002 ). Two oleosins were purified with 16 and 17 kDa experimental masses. Other biochemical information:As oleosins are oil soluble and may be carried over into oils, they may account for reactions to peanut oil. Pons L, Chery C, Romano A, Namour F, Artesani MC, Gueant JL. The 18 kDa peanut oleosin is a candidate allergen for IgE-mediated reactions to peanuts.